Journey through more than 5,000 years of art history. From the relics of antiquity to works in the vanguard of contemporary movements, the Gallery offers a panorama of the world’s art. 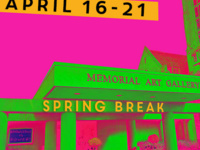 MAG will offer special pricing during Spring Break, Tuesday, April 16-Sunday, April 21, 2019. Kids 18 and under are free with paid adult admission. Loved hearing the stories of women in our community leading and making Rochester a better place for all. Sarah's murals are a must see. I really enjoyed the performance by Jame Duffy school #12 & the cultural displays were informative.